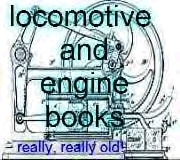 Take a look at these old books on locomotive, steam, hot air, and gasoline engines. Really old! (Narratives and photos copyright Lindsay Publications, used with permission). Today, we don't think much about engines, but in 1910, internal combustion engines were starting to rapidly replace steam engines. The cast iron monsters described were high tech and prospective users needed education. This 18th edition revealed the secrets. There's not a lot I can say about this book other than it's a classic. It's loaded with photo's, drawings, and engravings of engines, and all the components that go into their construction from ignition systems to valve mechanisms, from clutches to lubrication pumps. You even get off-the-wall info on propellers for marine engines and use of steam engine indicators on IC engines. You also get a great illustrated chapter on converting coal into producer gas. These are big stationary plants to turn coal into gases that can be burned by an engine. This is great info for the guy who wants to perfect a small bumper mounted unit for his car so that he can burn wood instead of gasoline. These units may also be adaptable to the production of coke. Don't know. You figure it out. Build yourself a locomotive! Meyer was an associate editor of American Machinist magazine, a member of the ASME, and chief draftsman for the Grant Locomotive Works. If any one could take you by the hand and show you how to design an 1892 locomotive from the ground up, he could. You learn every aspect of design and construction with over a thousand illustrations, most of them being incredibly detailed working drawings. You get detailed how-to knowledge that can only be acquired from working in the industry. For instance, Meyer discusses milling special grooves in order to remove pressure from the back of the slide valve. Into the grooves are placed metal strips supported by springs. Meyer will tell you the master mechanics in the roundhouse disliked spiral springs because lubricating tallow would build up there. Elliptic springs solved the problem but lost their strength over time and created other unique problems. You get that kind of detail and insider information throughout this big volume. Who on earth needs to know about the effect of lead counterbalance in the rim? or that bearing pressure can be significantly greater in the knuckle-joint pin as compared to a crank-pin? or why a sloping crown sheet is much safer when a locomotive is running down hill? You need to know these things and a thousand more if you restore locomotives, build models, study railroad history, or just want to impress the mourners at your mother-in-law's wake. There is no way I can describe this book other than throw a few quotes at you and reproduce a few of the illustrations. The detail is mind boggling. Let's suppose you're going to put a diamond-shaped smoke stack on your soft-coal-burning locomotive. Meyer shows you a diagram of a typical diamond stack. The cylindrical part D of the stack often consists of two shells, leaving an annular space about 5/8 inch wide between them. Sometimes four 1-inch holes are drilled through the outer shell just above the flange A, and another four holes are drilled through the outer shell near the top, for the purpose of creating a circulation of air through the annual space. This arrangement prevents the outer shell from becoming overheated and blistering the paint..." and on and on he goes. Blister the paint? I would be very proud to build an engine that would run well whether it were painted or not. Lindsay reprinted this turn-of-the-century bible on steam power at the suggestion of a number of people. It's really great. You'll find page after page of illustrations, usually great old engravings, and detailed technical description on every conceivable steam power device from Corliss, McIntosh & Seymour, and Porter-Allen engines, to Conover independent jet condensers, steam road rollers, Baldwin Locomotives, and steam fire engines. You'll see everything from hoisting engines to air and refrigeration compressors. You even get chapters on gas, oil, and hot air engines. You'll see engravings and cut-away drawings of the Otto gas engine, the Simplex naptha engine, the de LaMater-Ericsson hot-air pumping engine, and others. You get seventeen complete hot-air engine patents granted from 1871 through 1959. You get classics like the 1871 A K Rider patent and J Ericsson's 1880 patent. And there are others: the 1880 four cylinder beam engine of Woodbury, Merrill, Patten and Woodbury, the Eimecke double-acting engine,the huge Willcox four-cylinder engine from 1883 powered by a brick oven. The Stoddard patent of 1919 claims that his hot-air engine is so compact and powerful that it can be used to power an automobile. See Smith's four cylinder heat engine from 1930, and check out Meyer's 1959 patent with the rhombic drive. Be warned that some of these patents are hard to read. The drawings are in good shape, but some of the copy is difficult to read. Another seventeen hot air engine patents issued from 1871 through 1903! A number of these are variations and/or improvements on what essentially became the standard mass-produced Rider-Ericsson engine. Included are: the Rider patent covering a vertical piston engine with rotary valves, the '86 Rider double cylinder machine, and those by McKinley, Eckerson, Ericsson and others. George & Newt Hopkins' 1887 patent describes an interesting vertical engine with flywheel off to one side. Baldwin's engine looks like a dying elephant lying on its side taking its last breath! Truly bizarre! Another short patent by T. J. Rider pertains to improvements in the transfer piston of the Rider-Ericsson. The Chase horizontal stationary air engine sits directly on a fire box. The Vivian engine of 1890 features a central flywheel with rocking beams overhead to connect the cylinders on either side. Horace Robinson, Manchester, England created an engine with a vertical power cylinder and horizontal transfer cylinder with unusual linkage. Worth seeing. Anderson & Ericksson will teach you how to build a hot-air air compressor. See the Anderson, Erickson, & Wickstrom hot-air fan motor mounted on a wall bracket. And several others! Fourteen unusual internal combustion engine patents from 1881 through 1890. See Ravel's Oscillating Gas motor, AK Rider's gas engine, Hopkin's 1883 beam gas engine, Hiram Maxim's unusual vertical gas motor from 1884, the monstrous Hibbard rotary gas engine and more. Included are all three James Atkinson patents. You get his original 1884 patent of a four-stroke gas engine with a slide valve. You get his unusual 1886 opposed piston differential design with its unusual linkage that Dave Gingery is building. And there is, of course, the classic 1887 cycle engine already built by Lewis and Gingery that allows four strokes on one revolution of the flywheel. I.C. Engine Patents Volume Two, ?-? Another 18 unusual engine patents! The opposed piston Lindford engine provides a power stroke every one and a half revolutions of the flywheel. Benier's patent covers a novel way of firing the fuel/air charge and of keeping the engine cool. Examine the Wigmore rotary, the Teichman spider engine, the Frost triple cylinder, engines by Daimler & Diesel, and more! A few years ago I bought the last few hundred original copies of this 1943 book. They had been found in a warehouse in Australia. After I sold them all, I tried to convince my suppliers to reprint it. They couldn't do it. After several fruitless attempts to find the authors, I just decided to reprint it myself. It's too good not to. Here you get the secrets of powering an automobile on coal, coke, charcoal, and even wood using successful techniques developed in Australia and Europe. The preface reads: "The dangers which in 1940 threatened to cut off our petrol supplies, and thereby revived public interest in the gas producer have now passed the threatening stage and are in fact in operation. Lack of shipping space; lack of credits, the necessity of conserving our international balances, the entry of Japan into the war against us all combine to make the conservation of our petrol supplies a stern necessity. Gas producers are now to be seen everywhere supplying in the aggregate millions of miles of travel-service which would not otherwise be supplied.